Dressing sticks are designed to make it easier for you to get dressed if you suffer from mobility limitations (especially post-surgery) or if you or a loved one lack the use of a hand or or arm (Source). Generally, they're wooden or plastic sticks with different shaped hooks on either end to help you pull on socks, pants, dresses- though some buyers say they can be troublesome to use with small zippers and buttons (Source). From our research, many buyers find that they are actually multipurpose adaptive aids- handy, hooked tools that can be employed in parallel with a traditional 'grabber' (Source). In general, users say that as you begin using them you'll discover different applications you hadn't even imagined possible (Source). The RMS Dressing Stick 4.5 $ 28"
The Ableware Dressing Stick 3.9 $ 24"
The Mohawk Dressing Stick 4.1 $ 26"
The DressEZ Dressing Stick 4.5 $ 24"
The RMS 5-Piece Dressing Kit 4.5 $$ 28"
All of the dressing sticks we examined were made from wood, except the DressEZ, which is foam handled. Some buyers prefer the comfort and security of this style grip- plus it's designed to prevent harming fabrics. The Royal Medical Solutions (RMS) Kit is a bit different- it ships with a dressing stick, a grabber, an extra-long shoehorn, a long-handled bathing sponge, and a sock aid. If you're looking for an all-in-one solution for yourself or a loved one suffering from a permanent or temporary mobility impairment, this could be a good option. If you just need a dressing stick, the best option we've seen is the Royal Medical Solutions 28" Dressing Stick. It's a U.S.A-made adaptive aid engineered to help you or a disabled love one put on and take off their clothes. Specifically, it's vinyl-coated push & pull hook is designed to help donning shirts, skirts, pants, shoes, socks, as well as retrieving items. Consult the instructions and some YouTube videos (see below) to get a sense of how to use your adaptive aid. 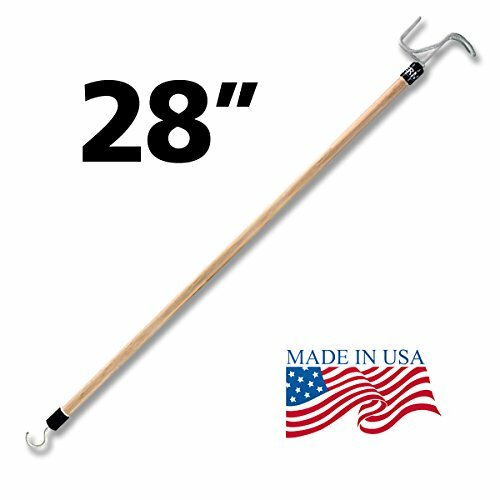 This 28’’ dressing stick offered by RMS is a good option if you are looking for a tool that can assist you with taking on and off your clothes. Users love the usefulness of this tool, but some do complain about its frailty. This product was designed carefully by healthcare professionals and it is made from high-quality materials. It has a vinyl coated hook/pusher and a “C” hook on the opposite end, which makes dressing easier. This dressing aid seems like a good choice if you have difficulties bending. The general user consensus concerning the RMS dressing stick is that it is a helpful, multi-purpose device. They state that it is well made and solid. However, some buyers complain about the metal end that bends easily. One online reviewer says that it is a pretty frail device, useful only for light-duty use. This dressing stick offered by Maddak Inc. is a solid option if you are looking for a multi-purpose dressing aid. Users like the usefulness of this product, but some do complain about the end of it bending sometimes. 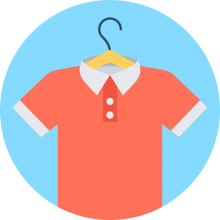 This product features a combination hook/pusher for assisting in putting on shirts and jackets, pulling up slacks or skirts, or removing socks. It also has a small hook on opposite end for pulling zippers and shoelace loops. This 24’’ dressing stick might be a solid choice for those who have limited range of movement. In general, users have a favorable opinion of the Maddak Inc. dressing aid. What they praise is that it is very helpful, does the job and is affordable. However, some buyers complain about the larger end which bends sometimes if subjected to considerable stress (for example, when used to remove compression socks). One dissatisfied user complains about the cheap construction. 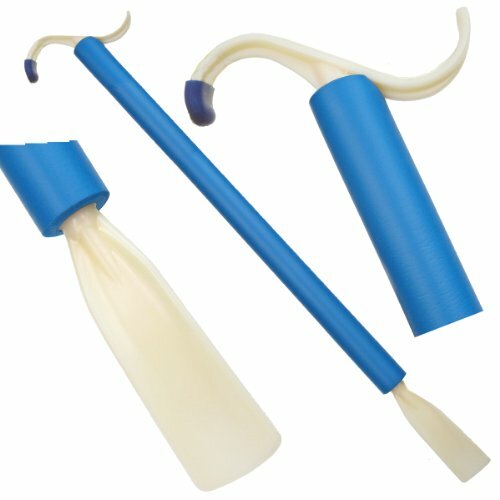 This economy dressing stick offered by Mohawk Usa is a good option for those who need an affordable dressing stick/sock aid. Users love the handiness of this dressing aid, but some complain about the cheap quality. 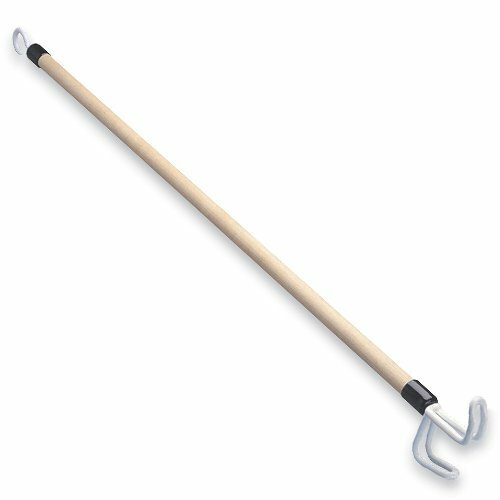 This product has a shaft that measures 26’’ and weighs less than 5 oz.It features a small C-hook at one end, as well as a large plastic-coated push/pull hook at the other. The deluxe model has a built-up foam grip on its shaft. If you want to make dressing and retrieving items easier, this dressing aid might be a good option. In general, users have a positive opinion of the Mohawk USA dressing stick and they agree that it is well made and sturdy. As they say, it makes putting clothes on and off less stressful. However,some purchasers complain about it being too thin and cheaply made. If you are looking for a top-rated dressing aid, you might want to consider this 2-in-1 shoehorn and dressing stick offered by ArcMate. Users love the handiness and construction of this tool, but some complain about its size. This product features a versatile push-pull S-hook with a non-slip cap, which allows for better control when handling clothing. Its smooth and rounded push hook slides safely along the skin. It has a big and soft foam handle. There is a resilient plastic inside of the shaft which will flex if accidentally sat on or stepped on. This 2-in-1 dressing aid could be a good choice if you’re looking for a durable and long lasting tool. In general, buyers have a very positive opinion of the ArcMate 2-in-1 dressing stick. They state that it is very well made, doesn’t bend or break and has a thick, non-slip grip with soft foam. Most of them agree that it is very durable and a good value for the price. However, some buyers complain about the length of the product, saying that it would be great if it was 2-4 inches longer. One dissatisfied purchaser shares that the stick is not sturdy enough to push off compression stocking. If you are looking for a dressing aid, you might want to consider this hip/knee replacement dressing kit offered by RMS. Users love its usefulness and functionality, but some do complain about several design drawbacks. 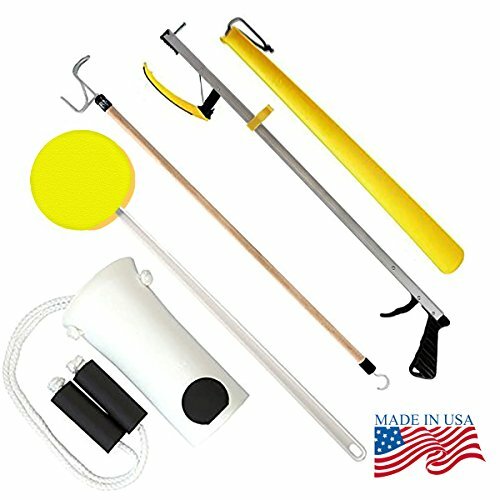 This product is a kit which contains 5 pieces: one 32″ reacher, one deluxe molded sock aid with 38″ foam handles, one 28″ dressing stick, one 22″ handle round sponge and one 18″ plastic shoe horn. It is designed carefully by medical professionals for people who are recovering from hip or knee surgeries. If you are looking for a dressing aid that you can use for surgery recovery, this might be a good option. In general, users are happy with the RMS 5-piece dressing aid kit. What they like in particular is that it is well designed, well made, highly functional and very helpful. All in all, they agree that it is a great set of tools for anyone with mobility problems. As they say, it helps post-surgery patients dress themselves and be independent. However, some purchasers have complaints regarding certain pieces from the set. For example, one user says that the sock aid is too wide for women’s socks. Another one states that the sponge handle seems too weak and flimsy to be useful. The first dressing stick we examined is the Royal Medical Solutions option- it is a USA-made assistance device. Skimming their product description, we see that it is a vinyl coated with a push and pull hook that bends a bit to help when you are putting on your skirts, socks, pants or shirts. If you or a loved one is so debilitated that they need one of these products, you might want to check out a portable bathtub shower bench- they make bathing much easier and more 'portable'. It's 28 inches long and marketed towards individuals who are suffering from medical issues that impair their mobility- perhaps a recent surgery that causes them to temporarily require dressing assistance. One reviewer who is undergoing hip surgery subsequently had trouble putting on their underwear or socks- used it in conjunction with a grabber stick so that they can maintain independent living without relying on caregivers or family for help. Another buyer relied on an occupational therapist to help them figure out the best way to employ it- they praised its durable construction and functionality, although some buyers suspect that the hook in the socket will eventually break. Another disabled buyer recommended it as a truly a multi-purpose assistance device- he also says that because of the vinyl coating, it does help ensure fabrics aren't ruined by it. The second dressing stick we examined is manufactured by Ableware- it's marketed to work for disabled individuals who need some help taking off their clothes and putting them on. It is engineered, they say, for buyers who are suffering from range of movement disorders or have use of only one arm or hand. One buyer wondered whether he could extend the length of this dressing stick, though buyers say you have to perform an adaptation to work with different, aftermarket reaching elements. One reviewer said that in terms of using it to put on your pants, the way they've done it is by laying their jeans on the floor in front of them, inserting their feet into the legs, and then employing the hook to drag them up your lower torso so you can use your hands to pull them entirely on. This item has received somewhat mixed feedback with one buyer who had undergone back surgery and couldn't bend over discovering that the tip broke off when they were trying to use it to pull on a sock. On the other hand, another spinal surgery patient recommends it over traditional grabber tools for assisting getting dressed- she says it took some practice using the hook but once proficient she's able to recommend it as a multi-purpose dressing assistance device. While buyers say it won't help you button buttons or zipper up skirts, the L-shaped end is good for blunter uses like socks, dresses, and pants. The third option is the Mohawk USA dressing stick- it's 26 inches long, weighing less than 5 ounces with a foam grip. As opposed to the other options, buyers say that it can be used for buttons and zippers. While it doesn't ship with instructions, reviewers tell us that watching some YouTube videos and fiddling around with it on your own you can discover a variety of applications for this device. Again, we discovered somewhat mixed feedback- one buyer complained that its large hook end became bent and then required straightening. A wheelchair-bound man tells us he employed it to maneuver the foot rest on his wheelchair. Another buyer who would undergone invasive shoulder surgery and as a result experienced limited mobility during his recuperation employed it for removing socks and various reaching tasks. Yet another buyer brings it along whenever they shop- it helps them when trying on clothes at Macy's and Bloomingdale's. The fourth dressing stick is actually part of a kit that includes a shoe horn. Buyers say that they prefer this to a wooden handled dressing stick, which they note often suffers from inflexibility issues. It uses foam to ensure your grip is comfortable and doesn't slip- Plus its rubber construction ensures that it will not damage fabrics. The last option we examined is the Royal Medical Solutions Deluxe kit-besides just a dressing stick, it also ships with a reacher, a sock aid, and an extra-long shoehorn. In addition, it ships with a clip so that you can attach it to rollators, wheelchairs, walkers and even bed assistance rails. One buyer who had her hip replaced bought this bundle to help her during a lengthy recuperation process that required she avoid bending or strenuous movements. She praises the quality of its grabber, complimenting it's sturdiness and ease-of-use, saying that its curved jaw makes it simple to grab onto things. As well, the sock aid has helped her remove compression stockings post surgery- these types of stockings are often times a real challenge to remove because of how tight they are. Another buyer who had undergone a spinal procedure was told by their physical rehabilitation therapist that they had to avoid twisting, lifting and bending- they purchased this kit to help ensure they complied with the post-surgical requirements. Another buyer whose elderly mother lives in a senior care facility purchased this kit after she had fallen and injured herself- it provided a variety of tools that helped his senior citizen mother cope with daily living challenges. Other buyers recommend purchasing the components separately- one reviewer criticized the quality of the grabber, complaining that it suffered from prong alignment issues.